With All Hallows Eve fast approaching, or even just the periodic strong full moon, spiritual energy is at a high. Ghosts, ghouls, and a handful of specters come out of the woodwork, pull a few pranks, and do their best to feel that connection with the living world for a while. Some are problematic, of course, and some people get overly frightened. Eventually, you know exactly who they’re going to call. Ugh, that annoying siren and those ridiculous costumes. One little moan and suddenly there are proton packs and laser beams being fired everywhere! The thing is, not all ghosts are here to cause a nasty ruckus. What about those who are kindly, sweet, and just want to hover around and remind the world that we were here and still are!? We need a diplomat… someone who can go and speak on all ghostly soul’s accounts and let the ‘Busters know that not all haunted sheets are cut from the same cloth. Perhaps with the right words and a kindly smile, we might have a brand new world where the living and the dead can walk hand in hand. 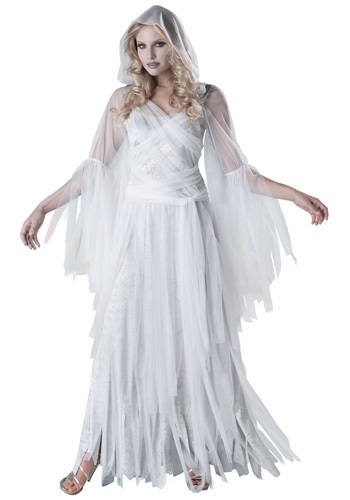 Our best bet is you in this Haunting Beauty costume. This lovely silver gown has white mesh attached to a wrap-like bodice that has the look of a loving mommy… er, we meant mummy. The sleeves have tattered ends, understandable after all these years of death, but still have an innocence and serenity about them that will surely help make your point. A sheer white sash can be worn about the waist or as a headscarf depending on precisely how sweet you’d like to look. In no time, they’ll be eating out of your hands. And, if not, then you can just rip out their souls and we’ll try that peaceful option again next year!